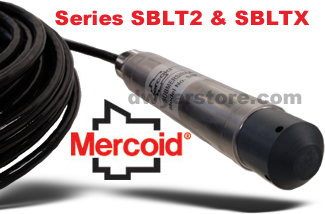 SBLT2 and SBLTX Submersible Level Transmitters are manufactured for years of trouble free service in the harshest applications. Both measure the height of liquid above the position in the tank referenced to atmospheric pressure. The transmitter consists of a piezoresistive sensing element, encased in a 316 SS housing. Bullet nose design protects the diaphragm from damage. The SBLT2 incorporates lightning and surge protection utilizing dual arrestor technology, grounded to case, eliminating both power supply surges and lightning ground strike transients (surge protection is not guaranteed and is not covered by warranty). The SBLTX is UL approved intrinsically safe for use in hazardous locations when used with proper barrier. Units come equipped with a 270-pound tensile strength shielded and vented cable. Ventilation tube in the cable automatically compensates for changes in atmospheric pressure above the tank. The vent is protected with a maintenance free filter eliminating particulate or water droplets from entering the transducer. Wetted Materials: 316 SS, 316L SS, Buna-N; Cable: Polyurethane or ETFE; Bullet Nose: PVC. Accuracy: ±0.25% of full scale. Temperature Limit: SBLT2: 0 to 150°F (-18 to 66°C); SBLTX: 0 to 176°F (-18 to 80°C). Compensated Temperature Range: SBLT2: 0 to 140°F (-18 to 60°C); SBLTX: 0 to 176°F (-18 to 80°C). Thermal Effect: ±0.02% full scale/°F. Power Requirement: SBLT2: 13 to 30 VDC; SBLTX: 10 to 28 VDC. Output Signal: 4 to 20 mA DC, 2-wire. Max. Loop Resistance: 900 ohms at 30 VDC. Weight: 2.2 lb (1.0 kg). Electrical Protection: SBLT2: Lightning and surge protection; SBLTX: None. Agency Approvals: SBLT2: None; SBLTX: CE, UL intrinsically safe for Class I, Div. 1, Groups A, B, C, D; Class II, Div. 1, Groups E, F, G; Class III Div. 1. (According to control drawing 01-700797-00). Intrinsically Safe Approval - Change model number from SBLT2 to SBLTX. MTL5041 - Intrinsically safe galvanic isolator. MTL7706 - Intrinsically safe zener barrier. Series SBLT2-300-500-ETFE Lightning and Surge Protected Submersible Level Transmitter, 300 psi sensor, with 500' ETFE cable. BSPT Male ISO 228 R 1/4"
BSPT Female ISO 228 RC 1/4"